Everything you ever wanted to know about putting...and then some. While not as glamorous as the new and expensive driver on any Father’s Day Wish List, Dad will certainly thank you for giving him ‘The Best Putting Instruction Book Ever!’, aptly named and published by GOLF Magazine, the fourth in a series of best-selling lesson manuals. That is, after he collects bets won from all the putts he’ll begin holing out. Few people ever study the art of putting or spend time on the practice green honing their skills despite the knowledge that the putter is THE scoring club. According to Editor David DeNunzio, all great putters understand that ‘putting is the difference between good scores and winning scores.’‘ With the subtitle ‘The 10 Brightest Minds in Putting Show You How to Make the Hole Look Bigger and Sink More Putts’, those who haven’t figured out the reasons they cannot putt will now comprehend why. When studying this book, the first thing you should know up front is that you cannot possibly grasp all of the information presented at one sitting. 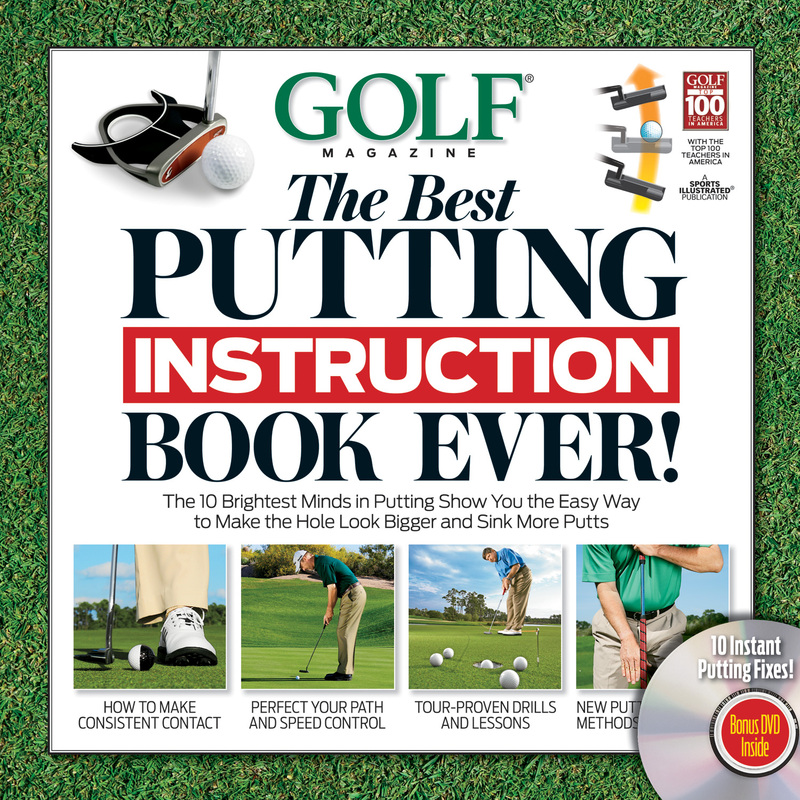 This is not a ‘quick fix’ tome, though there is an additional bonus attached to the back cover: a CD with 10 Instant Putting Fixes courtesy of a few of Golf Magazine’s Top 100 teachers. Instead, search through the various areas of expertise of the selected instructors, though many names may not be familiar to you; then, ponder what you’d like to improve about your own putting, scanning the chapters to zone in on your particular putting malady. If you do, this book will truly be a valuable asset to help eliminate unnecessary strokes on the short grass. Chapter 1: How to Pick the Right Putter; Master Fitter David Edel is a PGA teaching professional and club manufacturer who begins by questioning how the average golfer might haphazardly select a putter. Read on for three components to successful putting and how a simple change in putters can produce stellar results. Chapter 2: Building the Perfect Stance; Balance Expert and Ph.D. David Wright is also a GOLF Magazine Top-100 teacher. Some say stance doesn’t matter……but Wright teaches why understanding an individual’s biomechanics of balance, certainly does. Chapter 3: How to Calibrate Your Stroke; PGA Professional, GOLF Magazine Top-100 and Golf Digest Top-50 Instructor Mike Adams has authored 12 golf instruction books. The good news is that Adams allows you to combine your natural putting style along with putting mechanics you can live with. Chapters 4 and 5 deal with two separate types of strokes. What, you didn’t know there were two kinds? Former PGA Touring Pro and GOLF Magazine Top-100 and Golf Digest Top-50 teacher Stan Utley takes you through Mastering the ARC Stroke. LPGA Tour 3-time winner Maggie Will teaches how Mastering the Brush Stroke can lead to a more consistent stroke – and clears up some common putting misconceptions. Chapter 6: Read Greens Like a Pro; you may want to begin with this chapter to jump-start your putting quest. Most people have no clue how to read greens and any player can learn something here. Mark Sweeney ‘The Green Machine’ and lone amateur will take you on this ride of swales and dips and turf and grain. Chapter 7: How to Aim at the Right Spot; how many times have you played in pro-ams or scrambles where it is obvious your first putter is aimed all wrong, he or she misses by a mile, then exclaims “I pushed it! !’ This book is worth buying if only for gaining the insight presented in Chapters 6 and 7. Join PGA Professional and Aiming Expert Mike Shannon who shares this gem, which of course, you always knew: “over 92% of all the putts you’ll face in your golfing lifetime will feature some amount of break.” Are you a linear/analytical putter? Or maybe a feel/non-linear putter? Pick one. Shannon says you cannot be both. Chapter 8: Golf’s Best Kept Secret: The Long Putter; with an intriguing middle moniker, PGA Pro and GOLF Magazine Top-100 teacher Scott ‘Money’ Munroe indicates that switching to a long putter might not be solely for old fogeys or golfers with bad backs. He also includes an excellent sidebar: ‘The 10 Rules of Being a Money Putter’. Chapter 9: How to Practice for Improvement; just as beating balls endlessly and aimlessly on a driving range does nothing to improve your game and actually only strengthens weaknesses, Dr. Craig Farnsworth, AKA The Putt Doctor has shared his methods with over 90% of PGA Tour pros as well as the U.S. Secret Service, members of the Armed Forces, and U.S. Air Marshals. Do you really want all of those folks knowing information you don’t? Also included in this book are Watch and Learn indicators where you are instructed to go to a golf.com address for various video lessons to accompany certain teaching points. 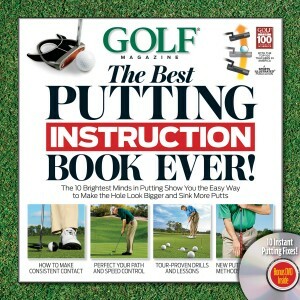 How to order: The Best Putting Instruction Book Ever!, in hardcover with 192-pages and 150 photos, retails for $32 ($38 in Canada) and can be purchased at Golf.com/bestputting.